Regrets are a natural byproduct of the human condition and the older we get, the more we accumulate. The key to continuing to lead a content and productive life is to avoid being crippled by them – something that is becoming an increasing challenge for the protagonist of this movie, Brad Sloan (Ben Stiller). Now 47 years old, he looks at his life as it currently is and laments that it doesn’t meet the lofty expectations he had harbored at age 20. Measured by the yardstick of material success, he lags behind his four closest college buddies. A midlife crisis as hit him point-blank. Nothing is more apt to get a person to take stock of his life than accompanying a child on college visits. 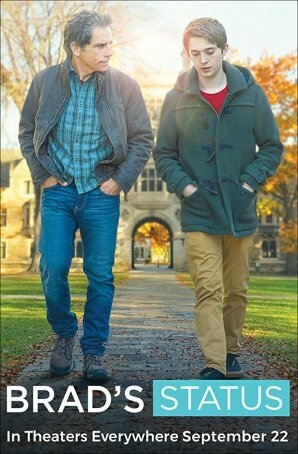 Brad’s 17-year old son, Troy (Austin Abrams), is viewed as a musical prodigy and has a legitimate shot (at least according to his guidance counselor) of being accepted to Harvard. So, leaving Mom (Jenna Fischer) behind in Sacramento, the father-and-son duo takes a cross-country plane trip to Massachusetts. While there, Brad commits a series of faux pas. During a conversation with an idealistic co-ed, his cynical advice about her potential career path causes her to call him out on the superficiality of his world view. A meeting between him and his old college buddy (and now wealthy TV personality), Craig Fisher (Michael Sheen), turns sour. Brad’s Status represents an interesting challenge for Ben Stiller. Known primarily for comedy, he rarely attempts something this purely dramatic. There’s a little Woody Allen at work here (without the “creepy” factor). Stiller is convincing because of the everyman qualities he brings to the role. We cringe when he embarrasses his son (and himself) by being too paternal. One scene in particular stands out: while his son is interviewing, Brad lauds Troy’s qualities to a woman in the waiting room – one who is clearly not interested and whose daughter is probably just as accomplished. The sequence isn’t played for laughs – it’s perceptive in the way it represents a certain kind of parent (someone we hope to avoid being and being around). The script, credited to director Mike White (whose career high-point to-date may be writing School of Rock and whose career low-point to-date may be as one of the names on the screenplay for The Emoji Movie) illustrates a knowingness about the middle-aged male psyche. There comes a point in every person’s life when they realize they have more years behind than what lies ahead. The bloom of youth and its attendant optimism are gone. Brad is at that crossroads. He is afflicted with creeping doubt. He doesn’t “act out” in outrageous fashions (the most rebellious thing he does is to sneak out of his hotel room to have a few drinks – and nothing more – with an attractive 21-year-old) but, as his internal monologue reveals, he is beset by ennui. Even when the cracks in the “success” of some of his college friends are revealed, he still isn’t sure he took the right path. White stocks Brad’s Status with an effective supporting cast that includes such recognizable names/faces as Michael Sheen and Luke Wilson, but this is Stiller’s movie from start to finish. His performance keeps it afloat because, in the end, it’s not about the airplane ride, the college interviews, the late-night rendezvous at the bar, or the disastrous dinner with an old friend – it’s about Brad coming to grips with who he was, is, and will be. That’s a difficult thing to dramatize because such an internal realization isn’t inherently cinematic. White, however, has found a way to do it and, although the pacing is uneven, the end result satisfies. The movie may be marketed to art house audiences but it has something to say to (and about) us all.